A whaleboat is about to strike a whale. 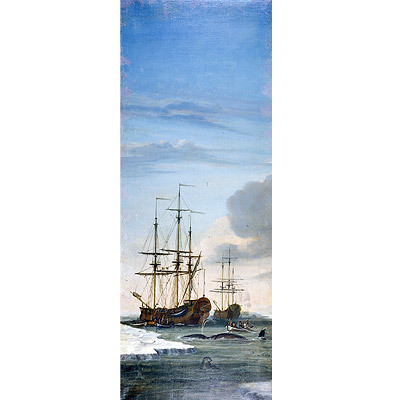 In the background aboard the whaler De Vrees, a whale is alongside and men are taking off its blubber-rich skin, while actually standing on the whale. Later whalers had stages. Many Dutch whalers cut the blubber in small pieces, put it in casks and tried out the blubber ashore.